Judo is derived from Jujutsu. It was created by Professor Jigoro Kano who was born in Japan on October 28, 1860 and who died May 4, 1938 after a lifetime of promoting Judo. Mastering several styles of jujutsu including Kito-Ryu and Tenjin-shinyo Ryu in his youth he began to develop his own system based on modern sports principles. In 1882 he founded the Kodokan Judo Institute in Tokyo where he began teaching and which still is the international authority for Judo. The photo below shows Jigoro Kano with a gathering of jujutsu leaders in 1921. The name Judo was chosen because it means the gentle or yielding way. America’s first introduction to Judo was in the late 1800’s. In 1904, Yoshitsugu (Yoshiaki) Yamashita, one of Kano’s students, traveled to the US and taught this Japanese sport to Theodore Roosevelt and West Point cadets. Although many local clubs and regional associations developed, attempts to organize Judo on a national basis were not successful. During the early 1930’s Judo was taught at several colleges in California. In 1932 Kano lectured on Judo at the University of Southern California. In this same year four US Judo associations were formed and later became recognized by the Kodokan as representatives of American Judo. You can find more information about Judo history here or here. The aim of judo is to utilize physical and mental strength most effectively. Its training is to understand the true meaning of life through the mental and physical training of attack and defense. You must develop yourself as a person and become a useful citizen to society. More about philosophy here. The basic principles of judo are easy to grasp and are essential for the person studying the technique of judo. Judo techniques enable a weak and small man to overcome a large and strong man because they are based on scientific principles such as leverage and balance. More about principles here and here. The word Dojo has many meanings, such as exercise hall, practice hall or place of learning the way. It formally was used by Buddhist monks in reference to worship, it also could be a meditation hall or club. As you can see it can mean a great many things to the martial arts that you are studying. Our sport being Judo, we refer to it as a Judo Dojo. Learn more about the Traditional Japanese Dojo here. Find Judo Clubs Worldwide here. Judogi is the formal Japanese name for the traditional uniform used for Judo practice and competition. It is actually derived from traditional articles of Japanese clothing. Jigoro Kano derived the original Judogi from the Kimono and other Japanese garments around the turn of the 20th century, and, as such, the judogi was the first modern martial-arts-training uniform. Over the years, the sleeves and pants have been lengthened, the material and fit have changed, the traditional unbleached cotton is now a bleached white, and blue Judogi have become available; nevertheless, the uniform is still very close to that used 100 years ago. Info about competition Judogi and places to buy it. Part of the judogi is the belt, here is how you can tie your belt and video. Also learn how you can fold you gi here. Achievement in Judo is recognized by a series of ranks. The student ranks are called kyu and are usually differentiated by colored belts (obi). Different colors may be used around the world and in some countries there are more than 6 kyu ranks. The ten black belt, or expert, ranks are called dan. Learn more about traditional Judo ranks here and what does black belt really mean. Sansei. The term sensei includes several levels of meaning. Some martial artists equate it with “master”, but this is a meaning that is not used much in Judo circles. As you advance in Judo it becomes very apparent that there are so many techniques and aspects of Judo that it would take a lifetime to learn them all. Mastery seems to stay just out of reach, and it is not something that can easily be achieved or claimed. There are moments of mastery, like when a competitor achieves the elusive effortless ippon (win), but they are fleeting. There is always more to learn, and Judo teachers are usually the first to admit that they are more like beginners than masters. 10 things you should know about your Sansei. Bowing. Through very specific customs an orderly, functional and efficient method of conduct has been laid down for use in all Dojo. One of the very first items of etiquette which the Deshi (student) must learn is when they enter or leave any Dojo, they must perform a Ritsu Rei (standing bow) in and out of the Dojo. This Rei is not just a physical thing to do, but is also mentally done. Sitting. When in any Dojo you are to remain seated in the correct Seiza (kneeling seated) unless the Sensei tells you to sit some other way. 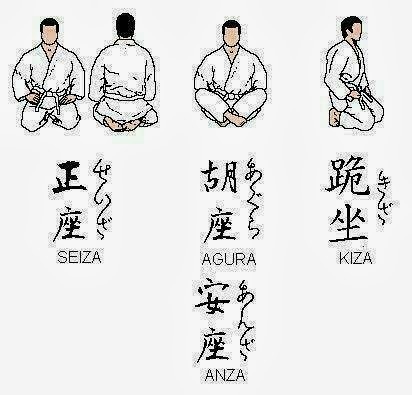 The properwayto sit is ether the Seiza, or Anza (cross legged). At no time is anyone below the rank of Black Belt rank is ever allowed to sit in the Kamiza area of the Dojo. When you are seated in a Dojo it is improper to sit with your feet and legs stretched out in front of you, or to lay back on the mat in any manner, unless you are engaged in some kind of special training, or doing a special type of Taiso. It is also improper to lean back with one or both hands on the mat behind you. Judo competition rules have evolved gradually over the past century, but especially since the formation of the International Judo Federation in 1951. The earliest recorded rules dealt with individual matches, and it was only later when Judo tournaments were organized with large numbers of competitors that methods had to be created to determine who was the winner among a group of people. Find original Kodokan rules here, official International Judo Federation rules here and article about evolution of rules in Judo. Also here is a simple Competition guide and info about what to expect at a tournament. Find all Referee signals here. And list of main competition penalties here. Questions and answers about Martial arts, Judo, Kodokan, and more.